This is a very old traditional model representing a sambo, “a small wooden stand used for offerings in Japanese religious services,” according to the late Isao Honda in his book, The World of Origami. It’s an intriguing model in that it has a “false bottom,” meaning it’s not as deep as it looks from the outside. So you don’t need as much candy to fill it as you might think. For a really useful and practical dish, make it from a 12-inch square sheet of scrapbook paper. A 4-inch square is the perfect size for a single Hershey’s Kiss ™. We like non-origami papers for this model. Scrapbook papers and colored printing paper are thicker, which makes a sturdier dish. Most scrapbook cardstock, on the other hand, will be too thick. The disadvantage of non-origami paper is that the model gets quite thick toward the end of the folding sequence. Use the back of a spoon or similar tool to make good creases. Click for folding tips. Tips: If you’ve never folded a square base (also known as the preliminary fold), we suggest you practice it first. 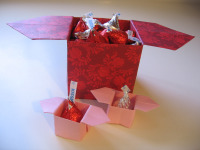 We also suggest you practice the candy dish with regular origami paper before using thicker paper. 1. Begin with the white side of the paper up. 2. Fold the paper in half, side-to-side, both ways, and unfold. You should have the creases shown. 3. Fold all four corners in to meet at the center. Tip: Take your time to keep your folds and corners as neat and perfect as possible. 4. Turn the paper over and orient as shown. 5. Fold the model in half by folding the lower triangle up. 6. Fold it in half again so you have a really small triangle. 7. Important: Spin it around so the open edges are away from you. You should see only folded edges and none of the white side. 8. Open the upper triangle and squash it into a square. Tip: This step is exactly like the squash fold in the square base, but the paper is two layers thick. If you are working with thick paper, a pencil or similar object can help smooth out the corners before squashing. 9. Your model should look like this. 10. Turn the model over and repeat the squash fold on the other side. Pick up the triangle (looks like a sundial at this point), open it, and squash. 11. You should have a thick little square. 12. Important: Spin it around so the open end is away from you. 13. Insert your finger, or a tool, in the slit in the paper to where you can see the white side. This can be tricky. Take your time working your fingers in there. 14. Spread the edges apart to where you can get both thumbs inside and continue pulling the pocket open. 15. Squash into a rectangle. Tip: Gently poke your fingers or a blunt tool into the corners to help open them before squashing completely. 16. Turn the model over and repeat making the rectangle on the other side. You should have a little house with a split roof. ...until you have a solid roof and two layers on each side. 18. Working with the top layer, fold the sides in to meet the center crease. 19. Turn it over and repeat on the other side. You have an arrow shape pointing up. 20. Fold down the upper tip of the arrow. 21. Turn it over and repeat. A spoon can really help with these creases. 22. Now for the fun part! Expand the dish. Pick it up, stick your fingers in the middle, and gently pull it open. 23. Square out the bottom by running your fingers around the inside of it, especially into the corners.